Everyone loves a crisp apple, but after that, well, some like ’em tart, some like ’em sweet, and some just like ’em! 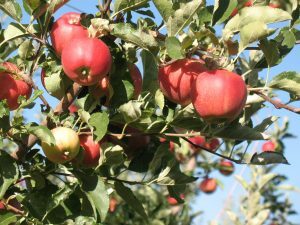 We start our apple harvest with Sanza in late August and finish with Granny Smith in late October. In between we pick another twenty some varieties ranging from the well known Gala and Fuji to the eclectic Esopus Spitzenberg and Pitsmaston Pineapple. Each variety has it’s own unique flavor. Sweet and tart are just the start of the descriptions of all the subtle flavors. Taste the banana in a Gala or the licorice in the Freyburg. If you think Golden Delicious are mealy and bland, try one that is picked correctly – spicy, sweet, knock your socks off flavor. We pick all our apples at their peak of flavor and sell them right away. The best possible flavor off the tree is our goal and we taste test every variety multiple times before deciding when to pick them. Our goal is to have a new variety of apple every week at our markets and to help you realize the diversity of flavor that apples have.